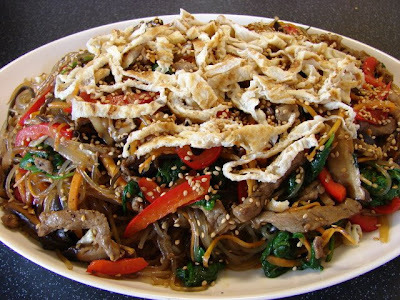 Japchae is Korean stir fried glass noodles with vegetables with or without meat. It is very similar to Chinese stir fried noodles. Korean glass noodles 'dang myun' are much thicker than Chinese glass noodles and greyish in colour. Chinese glass noodles are made with mung beans and Korean glass noodles are made with sweet potato starch. Here is the packet I used. Japchae is delicious, healthy, colourful and not that difficult to make. Cut the beef into strips and marinate with some sesame oil, soy sauce and a little sugar. Heat a large pan of water till boiling, boil the glass noodles for few minutes till softened. Test one before taking out. Drain and cut noodles with scissors into shorter length then mix with some soy and sesame oil. Stir fry the mushroom and woodear with a little oil or sesame oil, seasoned with a little salt/soy and a pinch of sugar. Fry the onion with a little oil till translucent then add beef and garlic, stir fry till beef is medium rare or fully cooked. In a clean pan add a little oil till hot and fry the egg into omelette. Cooled and cut into fine strips. With a large non stick pan or wok, stir fry the noodles till hot add vegetables and beef then add spring onion. Seasoned with more soy or sesame oil if needed and ground pepper to taste. (I find chopsticks are very good with mixing). If you like the japchae serving warm to cold, just mix everything together in a large bowl without stir frying. Dish up and sprinkle egg omelette and sesame seeds on top. Enjoy. **Suitable for vegetarians: leave out meat and egg. Can add more vegetables if you like. This sounds delicious Sunflower. 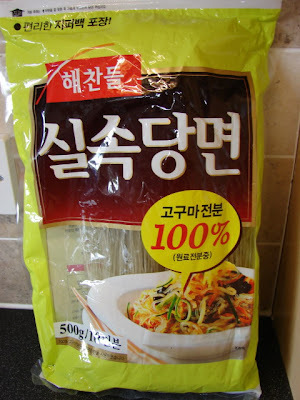 I have a packet of glass noodles, may have to try this dish very soon. Do use Korean glass noodles if you can find some for this recipe. They have a much firmer texture with a slight crunch than normal glass noodles. If you use normal glass noodles, just soak then blanch briefly for only few seconds with boiling water. Not sure the noodles can be stir fried well without sticking together in a lump. Best just mix everything together like a salad. Your recipes are always so beautiful. Thank you Ana. Worth a try it's tasty.